If you don’t have time to take a family vacation, that’s alright. You can take them for a day out or a weekend staycation at these resorts in and around Kanakapura Road and spend some quality family time. You could also go with your office peeps and make it a corporate outing. From paintballing to fruit picking, these are all the things you can do in Kanakapura. If you want to leave behind all the gadgets and games, and have a quiet peaceful weekend with your children, the Rare Earth Farm Stay is sure to make you connect with nature and enjoy the simple pleasures of life. Spend time talking, going for a swim, enjoying the greenery, picking fruits and getting pictures of your kids playing with farm animals. You’re definitely going to enjoy this off-beat resort and take away some great memories. If luxury is not something you’re particular about, but you would love the comfort homely feel, this Vana Resort is the answer. An ancestral home right in the midst of nature, you could enjoy the facilities offered by them with your squad or just do nothing and still have fun. If its good facilities you’re looking for, you can enjoy hiking, trekking, farming, swimming, outdoor and indoor games, adventure activities and the play arena here. This ancestral heritage property just off Kanakapura main road will charm you with its retro ambience and natural beauty. There are two spacious cottages that overlook lush, well-maintained lawns, a large play area for the children and a unique stone slide, a swing, a farm and many options of activities to pass your time. Be sure to check out the swimming pool that resembles an ancient elegant bath. They also have a watchtower where you can take in the lovely view. Staying true to its name, the resort has an underground cave theme with softly lit up rocky caves, and it is extremely fascinating. You could either pick a stay package or make it a day-long affair. You could get a spa therapy, have a rain dance, go for a swim, exert yourself with outdoor sports, jump on the trampoline or go on a bike ride with your friends at this resort. A little bit on the expensive side the resort is still pretty popular, so if you want to beat the crowd, head there on a weekday. This resort is usually popular with corporates for team-building activities, but its ideal for family and friends as well for its natural beauty. The resort is by a lake so for a large part of the day you can laze by the serene water body, or opt for some of the activities like kayaking and paddling in it. You could also exert yourself playing paintball or zipping on an ATV bike. At night, cozy up by a bonfire and request them to play some music for you. All you adrenaline junkies, this one is for you. Cave explorations sound like something you must do right? You can do that at Discovery Village, along with zorbing, rappelling, trekking among others where you can be guided by trained professionals. You could also relax in the pool, do some yoga and stay the night at one of their luxurious, spacious rooms. Also, they have an infinity pool and a barbecue grill. Just saying. Lie back and bask in the sun on a hammock surrounded by lush greenery and water bodies at this resort. A perfect weekend to leave behind the city buzz and become one with nature, a stay here calls for rejuvenation. You could also go for a dip in the pool, take part in adventure activities, quad bike rides, paintball, rain dance, boating and eat some scrumptious food. Go ahead and take your kids too, they’ll enjoy the play arena here. You’re definitely going to want to stay here for the weekend once you get a look at their luxurious and beautifully decorated room. 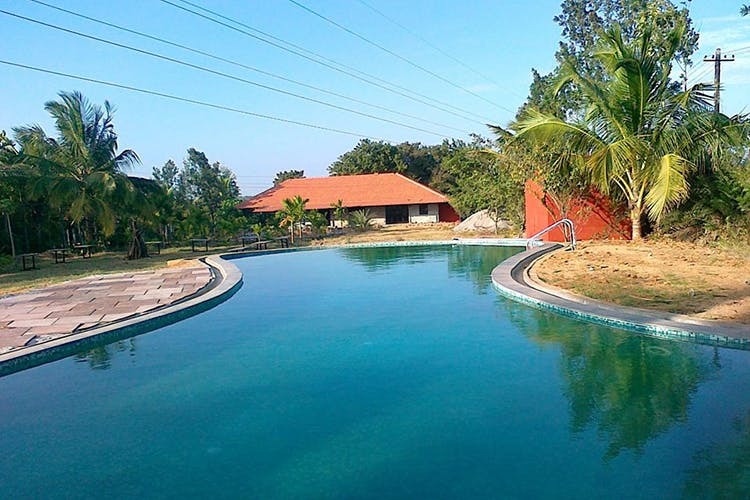 Just off Kanakapura road, this spacious and green resort is also ideal for a day outing with the children owing to the variety of facilities offered by them. Indoor games, a dip in the pool, rain dance, outdoor sports, a library and UV Paintball makes for a fun action packed weekend, doesn’t it?